Commercial Corner Mixed B2/B5 zoning, see pictures. 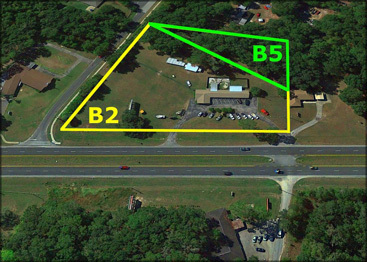 335 of Frontage on 2.54 acre B2 Parcel, with B5 parcel at .75 acres. 28000 TC’s with 2000 on 110th St. Owner willing to help facilitate rezoning. Building has a presently leased office. On the site are 6 one bedroom suites that rent for 600/mo. Also a block workshop ~450 square feet is in the rear portion of the property that has been leased out before. Billboard is income generating at $600/mo. See attached for rent roll. 10 Striped parking spots with much more space to expand.Three access points. 2 access points on HWY 441 – one at a cross over. Also access on SE 110th St.Perfect for a storage center, restaurant site, Autoparts, Tow yard, Hotel, Neighbors 2 shopping centers to the south (see aerial). Bring offers.